Washington faces two looming deadlines, with the Democrats and Republicans far apart on a solution. The U.S. government runs out of money on September 30 unless Congress approves a new spending law and will be unable to pay its bills by mid-October if the debt limit is not increased. Sitting in the House press gallery, Ted Cruz is on the closed-circuit TV's and out in the hallway (or outside?) someone is playing "Taps." Is it just me? I think Rand Paul is a more colorful filibusterer than these guys. Had an email from a Cruz aide saying: "He intends to speak, as he said, until he is no longer able to stand." Senator Ted Cruz has been speaking for more than 90 minutes (he began at 2:41pm EDT). Filibuster or not, Sen. Cruz's speaking time on the Senate floor that began at 2:41pm ET yesterday will end around noon ET today when the Senate reconvenes for a previously-scheduled vote to proceed on the House's government funding bill that defunds Obamacare. Cruz and his supporters know that Majority Leader Reid and Senate Democrats plan to strip out the Obamacare defunding provision, and they will likely succeed with the help of at least a few Republicans averse to risking a government shutdown over Obamacare. Cruz just began thanking his colleagues and supporters, while also taking pains to retain his remaining floor time and engage with Reid, who has taken the floor as well ("this is not a filibuster," Reid interjected). 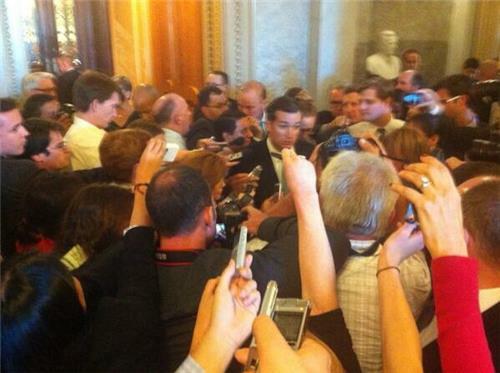 Cruz also made several requests of Reid and the body, including the unlikely one that his time be extended and the more notable one that the important cloture vote to end debate on the bill (today's vote is set to begin debate) occur on Friday rather than on the weekend "during football games" in order to increase its visibility. Democrats would favor a faster debate process, Republicans want more coverage of a difficult Obamacare vote, and the House, which will need to re-evaluate the Senate's edits to its bill, is hoping for more time once the bill leaves the Senate to act before the October 1 shutdown deadline. Even compared to Facebook, the word "friend" has never been so devalued as when Harry Reid just used it to describe Ted Cruz. Cruz won't allow a parliamentary inquiry, which Reid is asking to make so Cruz knows he can speak past noon until 1 p.m.
Cruz: "It appears I have the floor for another 90 seconds or so." Cruz ends at noon on the mark, taking a seat to applause in the chamber as the Senate president calls for order. An opening prayer is read to the chamber that makes reference to the "marathon of speaking" just witnessed, drawing a parallel to the "continuous" prayer necessary for the American people. Minority Leader McConnell takes the floor, after agreeing with Reid that the speaking time between now and the 1pm vote be divided equally among the parties. McConnell likens ObamaCare to a bridge out ahead for Wile E. Coyote "but unlike the cartoon, this isn't funny." On Thursday, U.S. House Speaker John Boehner urged Republicans to show flexibility in negotiating continuing government funding, which runs out in less than a week. Boehner said he does not see Republicans approving a spending bill without "add ons" -- which may refer to a variety of budget cut priorities, including limitations on the new healthcare laws contained in Obamacare. 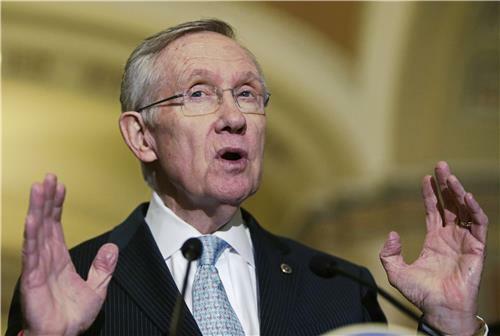 The Senate is expected to vote on the federal budget on Saturday. Meanwhile, House Republican aides say their current plan is to try to open up new talks with President Obama over the debt limit. U.S. Representative Cole said on Thursday that House Republicans believe the consideration of funding Obamacare should be focused toward debate over the federal debt limit, not the federal spending bill. The Director of the Congressional Budget Office stated it would be a dangerous gamble to default on any U.S. obligations if debt limit is not raised, damaging to the U.S. economy. CNBC asked half of the 812 poll respondents if they support Obamacare and the other half if they support the Affordable Care Act. - 29 percent of the public supports Obamacare compared with 22 percent who support ACA. - Forty-six percent oppose Obamacare and 37 percent oppose ACA. A recent NBC/Wall Street Journal poll asked if respondents believe the new health care law is a good or bad idea. Their results: 31 percent think it's a good idea and 44 percent say bad idea—roughly in line with the Obamacare response. A quarter of respondents said they didn't know enough to have an opinion, equal to the share in the CNBC poll who don't know or are neutral on Obamacare. Reuters' David Morgan reports: the Obama administration will delay online Obamacare enrollment for small businesses in federally operated healthcare exchanges until Nov. 1, marking a one-month delay in the roll-out, an administration official said on Thursday. The official, who spoke on the condition of anonymity, said that small businesses that want to purchase healthcare coverage for their employers would still be able to enroll beginning Oct. 1 through paper applications, in-person meetings or over the phone to a federal call center. Reuters video: 40% odds of a U.S. shutdown and default - Guggenheim Partners analyst Chris Krueger says a government shutdown, however messy and disruptive, may be the only way to avoid a far worse U.S. default when the debt ceiling is reached in mid-October. U.S. federal deficit and debt: Federal lawmakers are debating whether to raise the U.S. debt ceiling. Opponents argue that the U.S. debt as a percentage of GDP has ballooned to unsustainable levels. Meanwhile, the federal budget deficit has fallen sharply in the last few years. U.S. federal debt ceiling: Congress is debating whether to raise the U.S. debt ceiling with the cap on more borrowing fast approaching. Many lawmakers worry about how large the U.S. debt has grown relative to U.S. GDP. Good morning, intrepid Congress-watchers. We're in for a busy day, particularly in the Senate, which is set for a pivotal 12:30pm "cloture vote," or a vote to end debate on the House-approved bill that defunds Obamacare while continuing funding for the government past Tuesday's October 1st deadline in order to avert a shutdown. The cloture vote is more important than Wednesday's vote to proceed on the House bill, which you may recall came about an hour after Sen. Ted Cruz's 21-hour faux-filibuster. All 100 senators voted to proceed on Wednesday. Cruz and his allies have been arguing that they needed to make a stand before the Wednesday vote to set up opposition to today's cloture vote. If 60 senators vote for cloture, Senate rules will allow Majority Leader Harry Reid to pass with a simple 51-vote majority an amended bill removing the Obamacare defunding and retaining government funding - an outcome Cruz & Co. say they cannot abide. Many Republicans disagree with Cruz's and Lee's strategy of using the threat of a government shutdown to stop funding Obamacare, since they do not have the votes to approve the bill in the Democratic-controlled Senate and Obama has said he will veto it. But pressure from the two senators as well as outside groups affiliated with the conservative Tea Party movement led the Republican-led House to pass a spending bill that included a provision to defund Obamacare. The Republican speaker could bring up the legislation he's expected to receive from the Senate later Friday, known as a "clean" continuing resolution, because it preserves spending at existing levels through Nov. 15 without making any additional modifications to existing law. Boehner would have to rely heavily on Democrats, though, along with a handful of Republicans. This scenario would also mostly represent a political victory for President Barack Obama. But Boehner already said Thursday that he could not envision House Republicans accepting such legislation, and would likely attach new provisions to the spending measure before sending it back to the Senate. The Senate, which is controlled by Democrats, is extremely unlikely to accept any legislation to continue funding the government if it is larded with conservative initiatives. The debate this week in the Senate -- which saw the chamber move slowly, but inevitably, to strip the defund-Obamacare provision from the House spending bill -- demonstrated that in vivid detail. Keep in mind that this House drama will be taking place over the weekend, in a serious crunch to reach resolution before Tuesday's October 1st deadline -- and if the House does not simply approve the Senate bill, making modifications that the Senate must then approve, the ping-pong match will not be deadline-friendly. That may be why some House Republicans are weighing a 10-day funding bill, as Reuters reports this morning, in order to buy more time for negotiations. 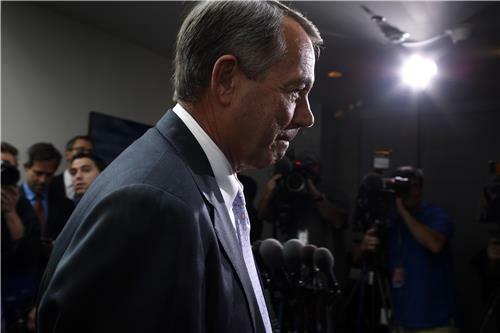 At the Washington Post, Sean Sullivan delves more into the choices that await John Boehner as he tries to control the fractious body once again, particularly given the debt ceiling battle and its mid-October deadlines. It just may be that, in common congressional practice, the real fight is pushed off just a bit longer. Feeling a bit overwhelmed, or even blue? No better cure than a bit of visual history -- check out NPR's slideshow of the 1995 government shutdown battle, complete with a photo of John Boehner himself delivering cold Christmas comfort to Bill Clinton (slide 10 of 13). Interesting things happen when President @BarackObama walks into the briefing room on Friday afternoons. Readers, the president has decided to speak to the press this afternoon in the wake of the Senate bill funding the government and Obamacare that the House must now take up. We will have video and live coverage right here, starting as soon as 3:30pm (always pending White House delays). Obama says he will address shutdown drama, but starts by announcing he's spoken with Iranian President Rouhani by phone. Obama says he his optimistic about diplomatic efforts after call, will instruct Kerry to move toward resolution. Obama says he spoke to Iranian president, an epic moment in relations between two countries. Obama says the "path to a meaningful agreement will be difficult," but believes there is cause for optimism and a responsibility to pursue an agreement, both for U.S.-Iranian relations and wider stability in the Middle East. Wow - first direct conversation between U.S. and Iranian leaders in a generation - since 1979. Obama graduated from high school in 1979! In a phone conversation b/w #Iranian & #US Presidents just now: @HassanRouhani : "Have a Nice Day!" @BarackObama : "Thank you. Khodahafez."